LOS ANGELES (AP) — California regulators recommended new restrictions Thursday on a widely used pesticide blamed for harming the brains of babies. The Department of Pesticide Regulation issued temporary guidelines for chlorpyrifos that include banning it from crop dusting, discontinuing its use on most crops and increasing perimeters around where it’s applied. The DowDuPont pesticide currently used on about 60 different crops — including grapes, almonds and oranges — has increasingly come under fire from regulators, lawmakers and courts. A federal appeals court in August ordered the U.S. Environmental Protection Agency to remove the pesticide from sale in the United States after it ruled the Trump administration endangered public health by reversing an Obama-era effort to ban the chemical. The EPA is appealing that 2-1 ruling to a full panel of the 9th U.S. Circuit Court of Appeals. Hawaii passed legislation in June that will ban the use of the pesticide in January. An environmental group blasted the new recommendations as toothless and said California should be taking the pesticide off the market after scientists for three state agencies found it was toxic and couldn’t be safely used at any levels. The California action comes as the state considers long-term regulations to restrict the use of chlorpyrifos and designate it as a “toxic air contaminant” that poses a risk of serious illness or death. Farmworkers in the nation’s leading agricultural state have been sickened several times in recent years when the pesticide drifted. More than three dozen workers harvesting cabbage in Kern County last year were affected when the pesticide drifted from neighboring farms, causing some to become nauseous and vomit and sending some for medical treatment, the department said. 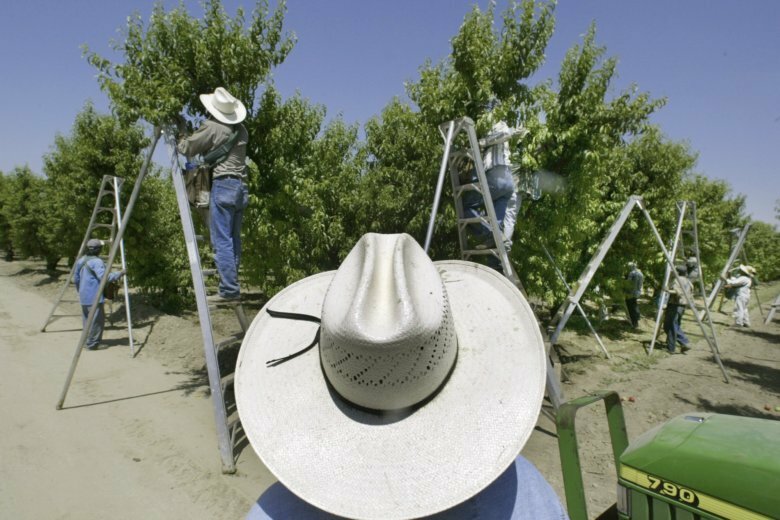 At least 13 people were affected in four incidents this year, including 10 workers in Solano County where the pesticide was applied to an almond orchard in July. The pesticide is in a class of organophosphates chemically similar to a nerve gas developed by Nazi Germany before World War II. Its heavy use has often left traces in drinking water sources. A University of California at Berkeley study in 2012 found that 87 percent of umbilical-cord blood samples tested from newborn babies contained detectable levels of the pesticide. Under pressure from federal regulators, the company voluntarily withdrew chlorpyrifos for use as a home insecticide in 2000. EPA also placed “no-spray” buffer zones around sensitive sites, such as schools, in 2012. DowDuPont disagreed with the recommendations and said it would hurt growers who rely on the pesticide, spokesman Gregg Schmidt said. The Almond Board of California said in a statement that its growers would follow state and federal regulations. The action by California comes as the state proposes designating chlorpyrifos as a “toxic air contaminant” that poses a risk of serious illness or death. In the meantime, the department is recommending county agriculture commissioners, who issue pesticide application permits, adopt the restrictions in January so they can protect health. Other recommendations include creating a 150-foot setback from homes, businesses and schools where the pesticide is applied. During applications, there would have to be a quarter-mile buffer zone for 24 hours around any field where the pesticide is applied and the only people allowed inside the area would be authorized applicators. The department also recommended limiting use of chlorpyrifos to certain crops to combat specific pests, such as weevils and certain types of aphids on alfalfa, stink bugs on almonds and maggots on leafy vegetables and onions..